Simple, Stylish and Sophisticated, the new Expression Steel is the latest frame to grace the Studio gas fires range, offering homeowners a complete focal point around which to express their very own decorative style. 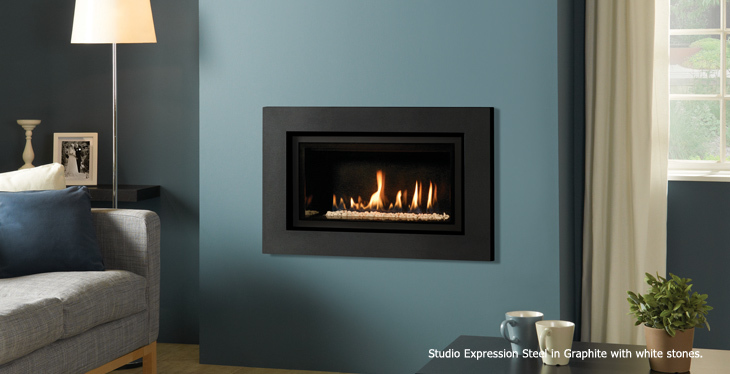 The Expression Steel has a simple smooth design in high grade steel, perfectly proportioned to complement and frame the eye-catching realistic log or contemporary glass and stone flame pictures within. Available for all four Studio fire sizes; 1, 2, 3 & 22, this deep profiled frame is available in a choice of either bold Graphite, or four vibrant finishes offering timeless simplicity or a striking centerpiece to fit with a wealth of interior decors. Finishes: Graphite, Metallic Red, Metallic Blue, Metallic Bronze and Ivory.